"Family is worth fighting for." 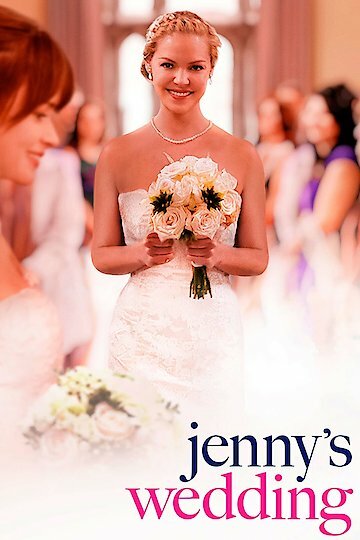 Jenny's Wedding (2015) is the newest film from romantic comedy darling Katherine Heigl, but this seasoned actress' film hits a deeper dramatic chord with a modern twist. Jenny Farrell has a loving and endearing family, but like so many women in their thirties, she is starting to feel the familial pressure to settle down and get hitched. After years of hounding by her well-meaning parents and slightly pushy siblings about her enduring single status, Jenny finally comes clean: she is seeing someone, and has been involved for quite some time. Understandably, Jenny's family is thrilled that she is not destined for a life of loneliness, but their excitement quickly turns to suspicious curiosity. Who is this mystery partner that the family has managed not to meet for all this time? Who has Jenny been hiding? After imagining Jenny's wedding for years, her mother and father are particularly intrigued to meet the gentleman who has stolen their daughter's heart. Enter Kitty, Jenny's long-term roommate... and partner. Jenny and Kitty have decided to get married and continue their happy life as an openly gay couple, with one exception: they have no idea how to break it to Jenny's family that her happily ever after will be with a woman. As Jenny finally works up the courage to reveal her sexuality to her family, her mother, father, and siblings must figure out how to understand Jenny's lie of omission and sort out their feelings toward her new fiancée. What follows is a touching portrait of the modern conservative family, and how they find ways to cope with changed expectations, shocking surprises, and unexpected love. Jenny's Wedding arrived in theaters on July 31, 2015 and on video-on-demand on August 1, 2015. Jenny's Wedding is currently available to watch and stream, buy on demand at Amazon, Google Play, iTunes, YouTube VOD online.